You might have two people that use the same home computer, each with their own Dropbox account. You might have multiple Dropbox accounts for different purposes, like one for home, where you share files with family, and one strictly for work. Unfortunately, you can only have one account at a time associated with your Dropbox sync application on your computer, and only one instance of the Dropbox sync application running on your computer at a time. So to use multiple accounts, you have to unassociate one account, and re-associate the other account to the application. You also need to set up different locations on your hard drive to keep the Dropbox files for the different accounts so you don't end up syncing the wrong files to the wrong account. The default location that Dropbox sets up to store your Dropbox files on your hard drive is C:\Users\YourUserName\Dropbox. To keep things organized nicely for multiple accounts, I add a couple folder layers to this location. 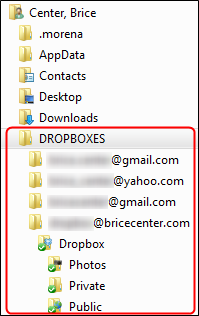 I created a folder called DROPBOXES that contains folders that are titled with the email address for each Dropbox account. Then, when the application asks where you want to put your Dropbox files, I can specify it in the right location, and I don't get any unintended cross-pollination (syncing) of files between accounts. 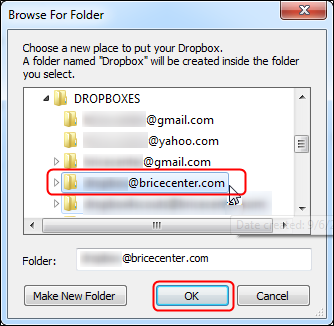 Dropbox takes care of making the Dropbox links open up the currently associated account folder on your hard drive. 1. Right click on the Dropbox icon on the lower right of your taskbar, and click Preferences. 2. Go to the Account tab, and click Unlink This Computer, and click OK on the notification that pops up. 3. After a short delay, the Dropbox Setup program will restart itself, and prompt you to link an account. Choose "I already have a Dropbox account," then type in the email address and password for the account you are linking, then Next. 5. If you are using a free account, the upgrade choice window will appear. Just click Next if you're sticking with the 2GB free account. 6. This step is very important: Choose Advanced for setup type before you click Next. This will allow you to specify the Dropbox hard drive location. 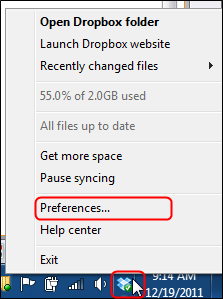 Then click "I want to choose where to put my Dropbox," and click Change. 7. Now CAREFULLY select the correct folder for the account you are linking, and click OK when it asks you if you want to merge the files. 8. Choose your preference on the Selective Sync window (I usually sync all folders). 9. Click Skip Tour, since you've probably seen it before, and click Finish and you're done. Your other Dropbox will begin to sync to it's proper folders.